Exciting new game developers for 2019! We really hope that you are all feeling well and having a nice warm autumn. The new year, 2019, is about to knock on the door and we would like to give you some nice gaming news. The industry of online casino games, and mainly slots, is about to become even bigger. Two new game developers will launch their games in the next year. GiG, Gaming Innovation Group, has started to make slot games that will be integrated on their platform. At the same time, the gaming developer Relax Gaming is launching their first slots. From what we can see right now, it all looks quite good. Relax first slot is a game with Vikings with nice graphics. What GiG will cook up is so far not to be known. But, they have been around in the business for so long, that we don’t think we need to be worried. Along with this, all our known game providers have new titles waiting for us. For people playing at new UK online casinos 2019, there are certainly a lot of nice games waiting. Halloween brings joy, and so are the new slots! T he holidays are fun in a lot of ways. And for online casino lovers, there are even more. This year, we have seen a lot of launches for new slots on the Halloween-theme. NetEnt might have had the biggest one; Halloween Jack. A really good looking one with the scary touch we all expect from a game this season. A not as famous new title is one from NYX. Polterheist, from the movie Poltergeist, is a more childish themed slot. But still with a big touch of Halloween. A funny, mystical world with ghosts on your reels. Burning pumpkins and a nice setting might make this a favourite among many players. 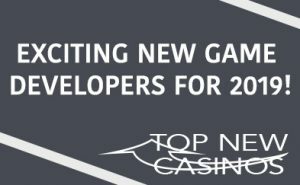 More news about all the top new casinos in 2019 will come. But for now, we hope you had a great Halloween and that December month will treat you nicely!